It was the first Tuesday night of the month and that meant a K1 Speed Jr race. This is the 3rd race of a 5 race series at K1 Speed, and Jason was ready and psyched up for the event. He got even more amp’ed when he found two face up “lucky” pennies on the way in. Kids are funny. The night’s race brought 14 drivers and with a few of the 13 karts down, they split the racers into two groups of 7. The upside to this is that there are fewer karts on the track making it easier to get a clean lap in. The down side is it will be a longer evening and scoring two races as one is a little funny. Jason qualified in spectacular fashion, even though he started in the middle of the field. He was able to get some competitive laps in early, moving as high as second, but then down a bit in subsequent laps. At about lap 6, the drivers immediately in front of Jason got tangled up. He managed to drive by and into clean track and press on the speed. In lap nine he set a blazing 17.722 second lap. This is a personal best, fastest lap of the night and the 2nd fastest time this month (yeah, 7 days in). This put him on the pole for the feature. In addition to putting in fast laps he was making great moves on the other drivers, including some well-timed passes in the closing laps. The karts are assigned by the order they come in from the last race and then by the position you start in. This gives a “random” draw for what kart you get. Some are better then others depending on a number of factors including battery charge. Jason got a kart that was low on power on the start and he quickly dropped to 2nd and the leader pulled away. He was still turning good lap times and was running a very tight line making passing difficult. In the 12th lap he entered the second corner a bit wide giving room for the drivers in 3rd and 4th to push by, knocking him off the podium. He finished 4th two laps later and was bummed, despite his excellent drive. He had no reason to be disappointed with the finish. He did a great job of running the kart he had, and kept all his laps at or under 18.5 seconds. On top of that, he is now in second place, 8 points back from the lead, with third place 4 points behind him. It is possible for Jason to move into first but it is a pretty tall order. He will need to beat the #1 driver in two races or two positions and there are two races left. The next outdoor race has been changed from our previously announced schedule. We are going to skip the CHMS Race 2. We determined that it is too much work without enough value. 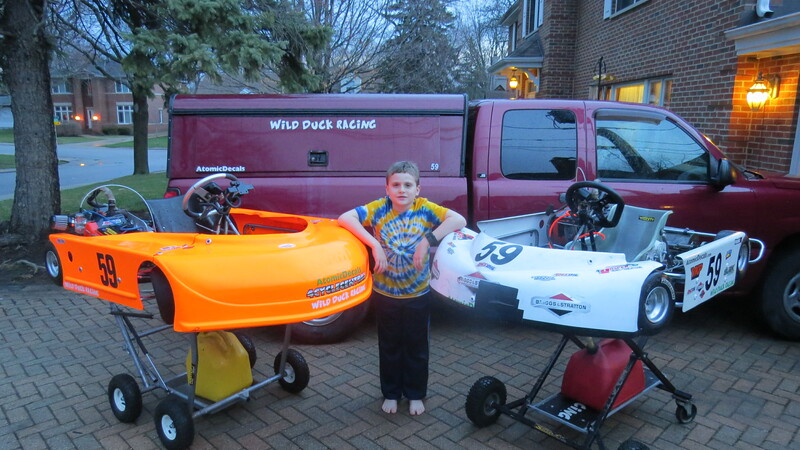 Instead we are going head to Badger Kart Club on Saturday for some practice, tuning, and and coaching, followed by camping at the track and racing on Sunday. This will also be the first race with two karts and two classes and I am hoping neither us or the equipment breaks under the strain. Thanks to Katie for putting up with yet another race at K1 speed. We are working on your races. And to Karen who got him there and kept him sane between races. GoPro, Slick Products, Shorai, Amsoil, Stardust Memorials, The Greenwood Restaurant, C&M Auto Service, Atomic Decals, Danrr Autobody, T.J. Ross. This entry was posted in Race Results, Racing and tagged K1 Speed, results by ChiefDuck. Bookmark the permalink.